The Chinese Navy last week evacuated hundreds of people from the war-torn country. Russia, Canada, and France are also reported to have recently conducted evacuations of their own. The website of the U.S. diplomatic mission in Yemen posted two messages on Monday laying out options for American citizens looking to flee the country. The first noted that, "The Indian government has offered to assist U.S. citizens who want to depart Yemen for Djibouti. This potentially includes flights out of Sana’a and ships from Aden. U.S. citizens wishing to take advantage of this opportunity should contact First Secretary Raj Kopal at the Indian Embassy in Sana’a at 00967 734 000 657." A second message stated that the International Organization for Migration (IOM) was working to arrange a flight out of the country to Djibouti at some point this week, and directed American citizens needing assistance to contact the IOM. Indian government officials have stated on Twitter that the United States is among nearly two dozen countries seeking their assistance with evacuating endangered citizens from Yemen, and claim to already have evacuated Americans. India has deployed a missile destroyer and a handful of other military and civilian ships to effect maritime evacuations, and the Indian Air Force and civilian aircraft are also assisting in the effort, according to a report in the Diplomat. The United States has military assets in the area. However, Marie Harf, a spokesperson for the State Department, said last week, "Doing something like sending in military assets, even for an evacuation, could put U.S. citizen lives at greater risk." The State Department's website currently states that, "There are no plans for a U.S. government-coordinated evacuation of U.S. citizens at this time." There are no reliable figures for how many U.S. citizens are currently in Yemen, but advocacy organizations suggest that those needing assistance number in the hundreds, many of whom have dual U.S.-Yemeni citizenship. 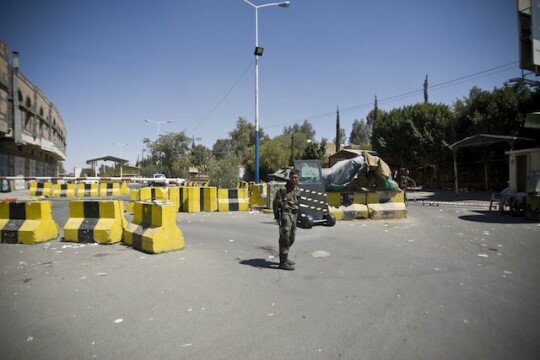 The U.S. Embassy in Yemen was evacuated in February, with American personnel flying out of the country on private jets provided by the nation of Oman. Marines guarding the embassy personnel were not permitted to bring their sidearms on board these aircraft, and were ordered to disable and abandon their weapons before leaving the country. A U.S. special operations training mission assisting the Yemeni government in its fight against al Qaeda withdrew from the country last month. This entry was posted in National Security and tagged Al Qaeda, Iran, Obama Administration, State Department, Yemen. Bookmark the permalink.